Get insights on users, their devices, user sessions and quickly track custom in-app events for every app built with ApiOmat. 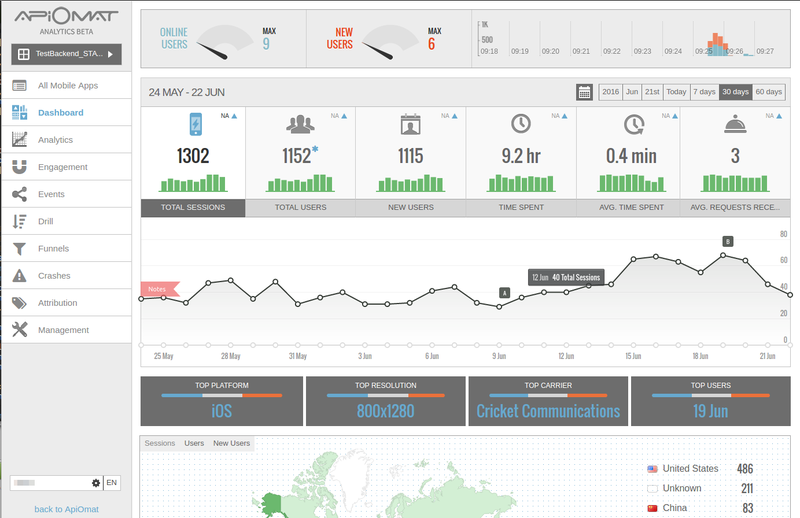 ApiOmat Analytics is built into every app created on the platform. This automatically gives you all the vital on your app users, their sessions and devices, as well as crash reporting - all with a single line of code. Developers can also create custom in-app events to measure how users engage with the app, and create funnels based around events to display the percentage of users following a specific pattern of events. The analytics information is stored in your ApiOmat installation, ensuring that your data is safe within your cloud or on-premise environment. Instantly track device information, user sessions, screen performance and more, no code required. Be aware of errors that happen client side and know the device information at the time of error and get the error message to know what went wrong and where. Create custom events specific to your app. Drill down to see the results you want by selecting an event and query through specific user groups. Create action funnels based on your custom app actions. Set up funnels to measure how many users are following your process and identify potential bottlenecks. ApiOmat Analytics is available as a separate tool and has its own installables including enhancements to the SDKs and Dashboard. When creating a backend, ApiOmat will automatically create an analytics app for each system (Live, Staging, Test) in ApiOmat Analytics. Additionally, most of the SDKs already include the matching SDK of the analytics tool. These SDKs provide the functionality to send data (page views, user information, events, ...) to ApiOmat Analytics which process the data on the server and saves it to the database. To view analytics data, click on "Use" in the context menu when hovering over the Analytics Module of the left menu in the Dashboard. This opens the ApiOmat Analytics Dashboard, which offers lots of diagrams and tables for analyzing the app. It is also possible to use ApiOmat Analytics for apps which are not based on ApiOmat. One only has to add the matching SDK of the analytics tool to the existing app and configure it with the app information in ApiOmat Analytics.